Author Rosemary DiMasi’s New Book “The Railroad Man: A Story and a Smile” is the Artfully Crafted Biography of a Family's Life on the Long Island Rail Road. Recent release “The Railroad Man: A Story and a Smile” from Page Publishing author Rosemary DiMasi is a collection of memories matched with gorgeous photographs depicting a fantastic life lived along the east coast of the United States. Rosemary DiMasi has completed her new book “The Railroad Man: A Story and a Smile”: the true tale of work on a rail road. caregiver to her mother, grandmother, and in-laws. Family was very important to Rosemary. At this point in time, she finally accomplished her dream. Her hobbies are collecting dolls, writing journals about her family (past and present) and movie stars, photographing wildlife, cooking, and baking. Rosemary believes that “Pasquale was and will always be the man with a story and a smile”. Published by New York City-based Page Publishing, Rosemary DiMasi’s exciting book is the story of a family history on the Long Island Rail Road. Pasquale started on the Long Island Rail Road in 1925. He was so proud to work for the World Fair from 1939-1940. Pasquale’s picture collection includes the Long Island Rail Road and the World Fair.The love and respect he has for life and the love he had for his wife, Filomena, his family, and friends is clear to see throughout the manuscript. 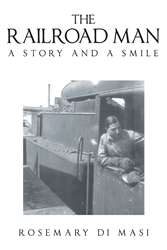 Readers who wish to experience this heartwarming work can purchase“The Railroad Man: A Story and a Smile” at bookstores everywhere, or online at the Apple iTunes store, Amazon, Google Play or Barnes and Noble.